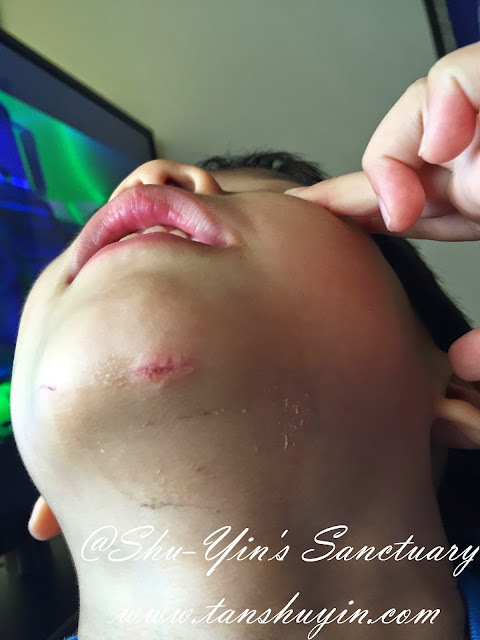 Shu-Yin's Sanctuary: Shern's High Fever and Splitted Chin with Stitches! 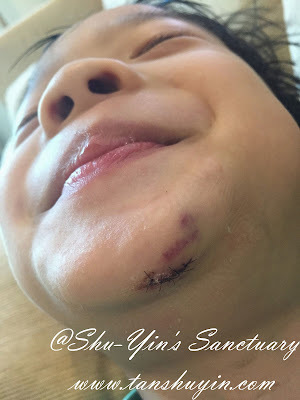 Shern's High Fever and Splitted Chin with Stitches! Last week was the week when both my kids were down. So it was a stressful week for all of us. As mentioned, it started off with Khye having swollen upper lips and fever, but on the same night itself Shern also also had a temperature. Shern's fever was mild initially, so I just gave him PCM before sleep and to just monitor him. The next morning, his temperature was on the borderline, so I allowed him to skip school for the day, and to see how it goes. And from then, his temperature soared higher to above 39 dC. Even PCM could not bring it down. Not even 4 hours after PCM, it went up to above 40 dC, and thus we gave ibuprofen to bring his fever down. 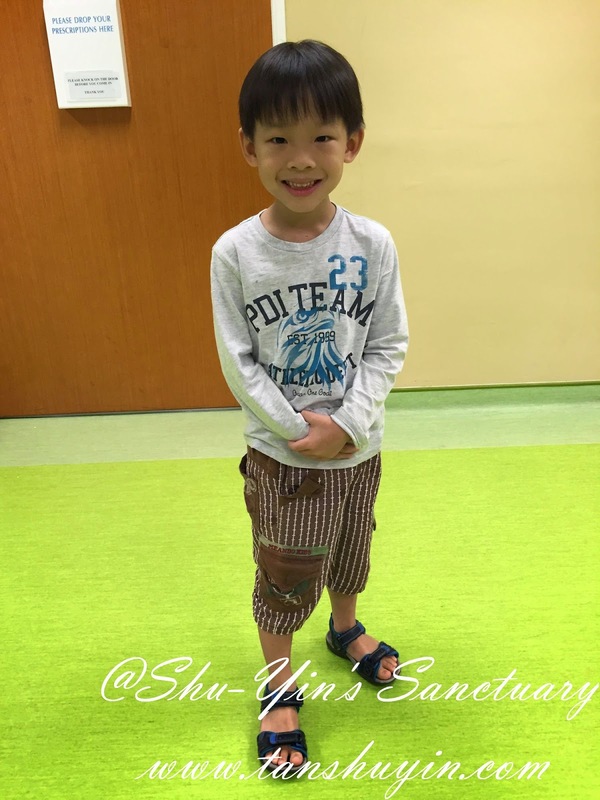 So on Wednesday, we decided to bring Shern to see his peds. And just 10 minutes before we were about to leave for the hospital, Shern had an unfortunate accident. 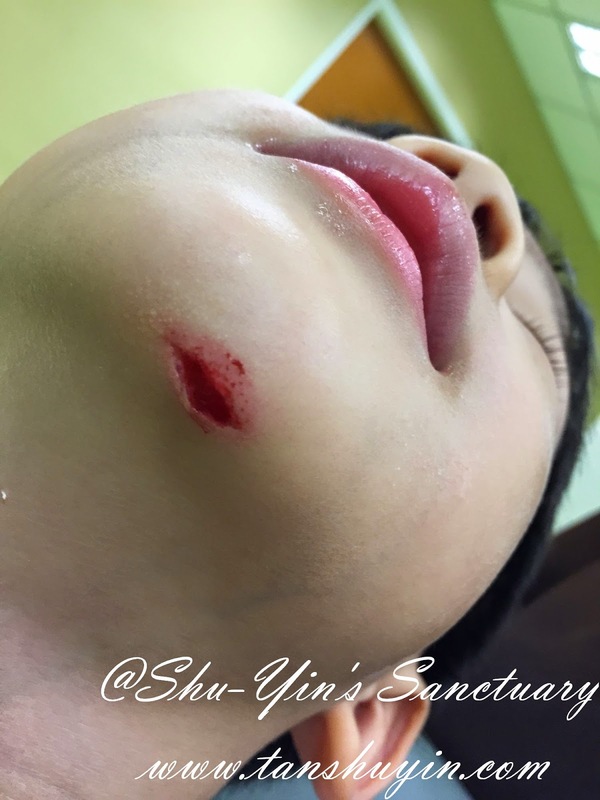 He stepped on Khye's clothes (my bad, which I left on the floor as I was showering Khye) and he slipped and fell on the floor, chin down and splitted his chin! And it was quite a big split/cut and surprisingly not too much blood. And since we were already almost on the way to see his peds, we just went straightaway. First we saw the peds regarding his fever. In the clinic, his fever was not too high, only about 38.3dC as he just took PCM a few hours. He saw his chin and said the cut was quite big and referred Shern to ENT specialist. I was surprised because I didn't know ENT doctors do these stuff. I thought it should be plastic surgeon or something. When it was finally his turn, Dr. Oh said biogel won't work for him and he definitely needed stitches. To tell the truth, my heart sank a bit when I heard that. I asked if the stitches used would be the dis-solvable kind, he said he could use that but he didn't recommend that because it would be a slightly longer healing time and also a more visible scar line. And the doctor asked me if Shern would cooperate. If he does, then he would do it straightaway and procedure would take less than an hour under local anesthetic. If not,then he would treat it as a surgery which means he would prep a surgical room, and Shern would need to fast for 6 hours and put under general anesthetic. 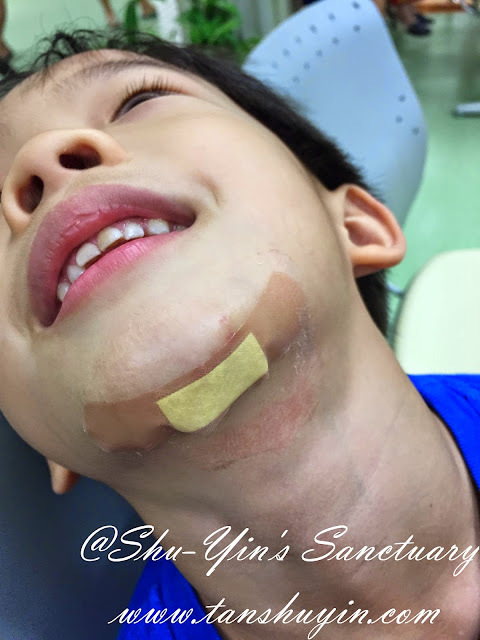 I told him it should be no problem and we would try to do it the easier way, but I told the doctor not to scare him and just tell Shern that he needed to clean the wound. The doctor agreed. This is Shern in the emergency room downstairs after being prepped, and while waiting for the doctor to come down. While waiting, Shern said he was very cold and was shivering. I took out the jacket for him to wear. And that was when I checked his temperature and found that he was having high fever of 39.5 dC! No wonder he was shivering! I quickly told the nurses there and they gave him PCM. So my brave boy was having high fever of 39.5 dC while being stitched up! Poor boy! No photos of him being stitched up because I was busy holding the hands of my little hero. Dr. Oh was really gentle with him, and he was trying to distract Shern as he gave him 3 jabs of anesthesia on his chin to numb him out. 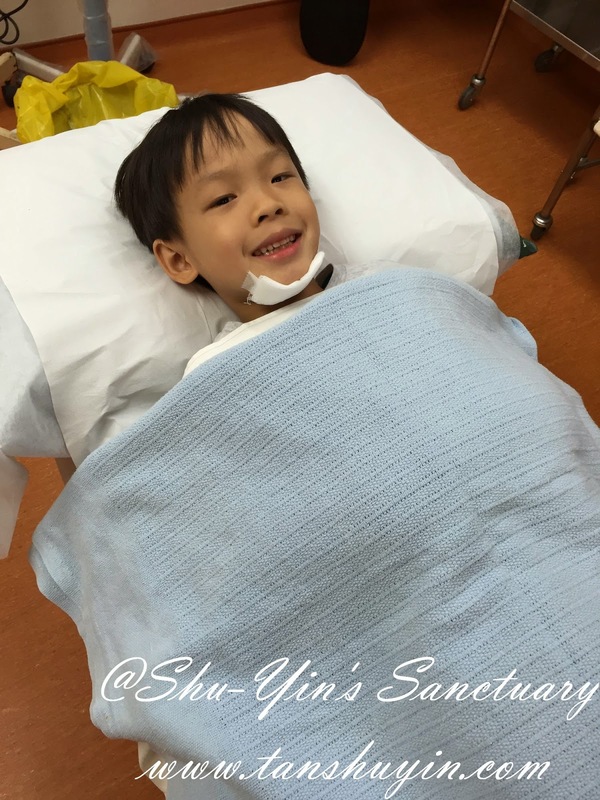 Shern said a big 'ouch' on the first jab and after that his 'ouches' were not so loud, which means the anesthesia was working. haha. 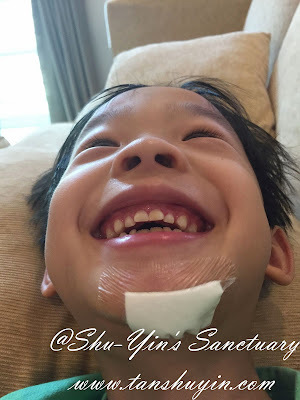 The doctor used a sterile cloth with a hole which covered up Shern's eyes n face with the hole at his chin which was actually a good idea because besides protecting Shern's eyes over the bright light, it also covered up his vision and that Shern couldn't see that the doctor was suturing his wound with a thread and needle! That was why Shern did not freak out! 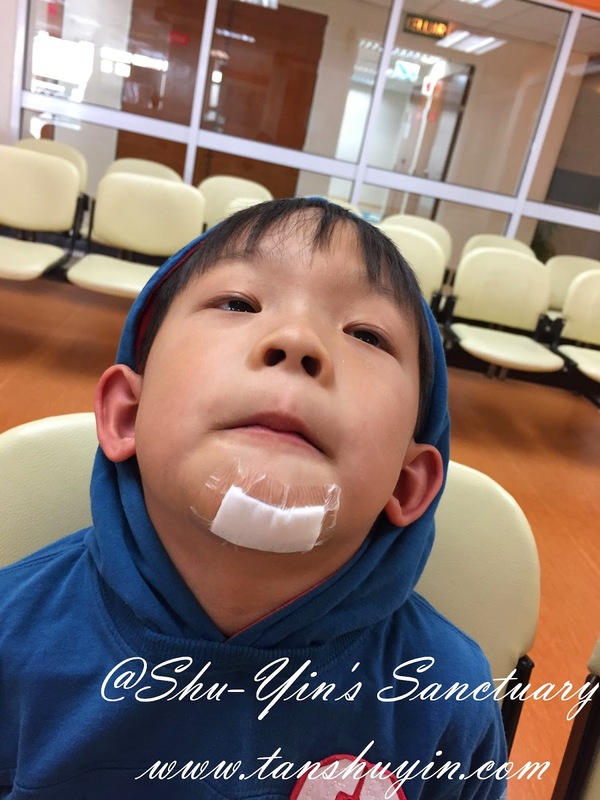 It took the doctor about half an hour to finish suturing 5 stitches on his chin! 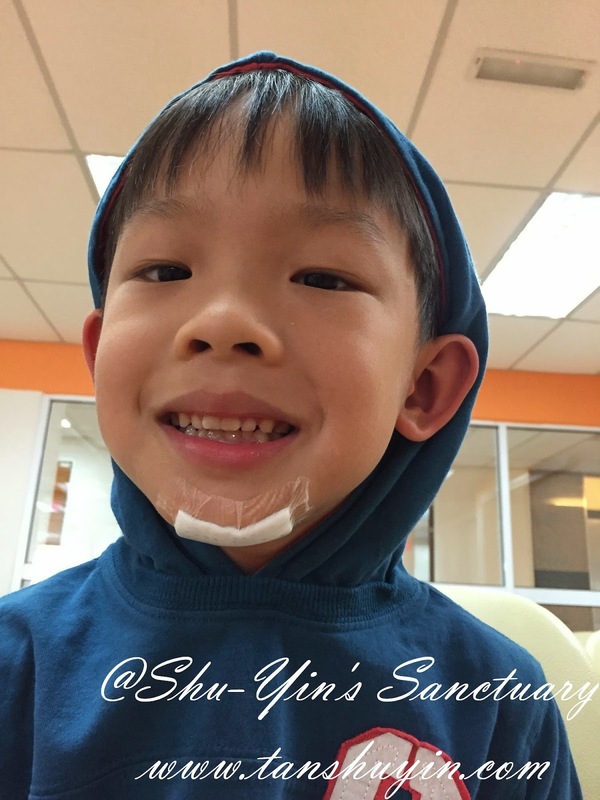 This is Shern after having 5 stitches on his chin! The nurses outside the room was surprised when he saw us walked out the door. "Finish already ah? Wah, so clever, no sound at all! What a brave 5 year old!" 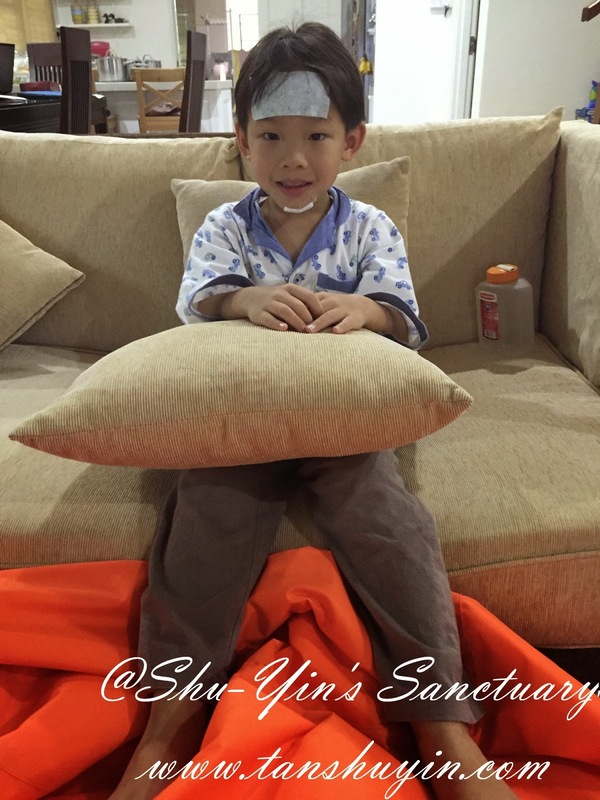 As it was almost 1 hour after his last PCM by the nurse in the ER, Shern's fever instead of coming down went up to 40 dC! So I quickly took him back to his peds room to check if something needed to be done as he was really having high fever! (and I knew it was not because of his wound). 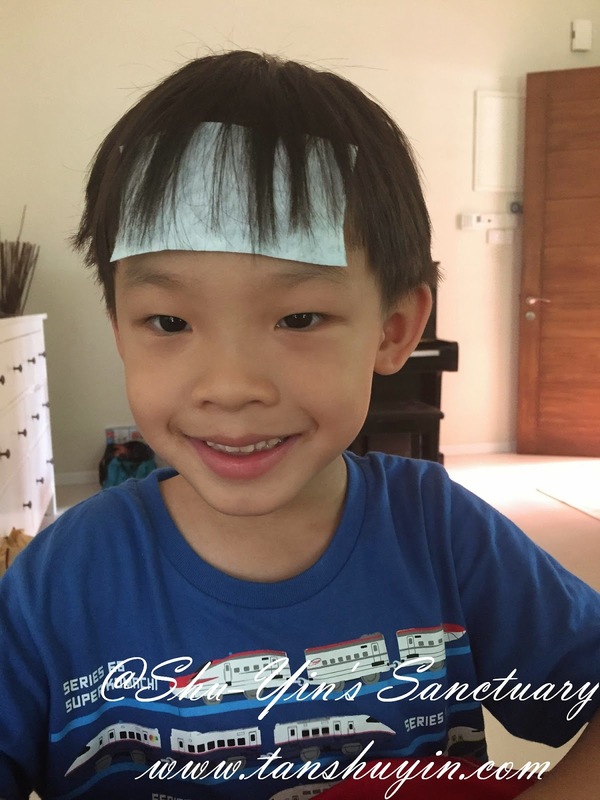 Dr. Chiah gave him a dose of ibuprofen, and then suggested that since we were there, why not go for a nasal swab and also a blood test to rule out Dengue fever, and Influenza type A&B. I agreed since this was already the 3rd day of his fever. I was a little afraid that Shern was having another long battle viral fever which happened 2 years ago with super high temperature that would not come down! And so off Shern went to the lab for a nasal swab and also took a blood test. He got a little uncomfortable having his nose swab but it was done fast so ok, and as for the blood test, the staff nurse who did it was fast and Shern just gave a loud 'ouch' and it was done! 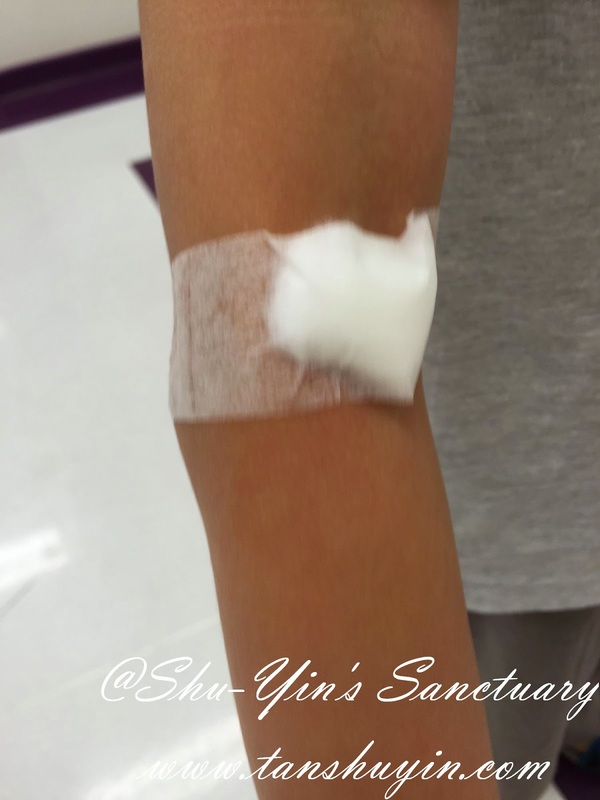 Shern thought the nurse was 'catching some bad ants that bit him' (yes, that was what I told him! haha). So there you are, my brave little trooper having done 5 stitches on his chin, a nasal swab, and a needle poking on his arm, while battling high fever....all in 4 hours! What a brave boy he was right! Total hospital bill in 4 hours = RM1.5k+! Results for the blood test won't be out for 2 hours so we went home to let Shern had some rest. He ate a sausage bun while waiting, and I was glad he finished the whole bun. But back home after a nap, a few hours later, my poor boy vomited out the bun which means his body did not digest it at all. He was still feeling poorly with his temperature soaring up again to 40.3dC! I was really worried about his fever then. But luckily he was drinking a lot of water, and that he had no problems taking medicines, unlike Khye, which certainly made my life so much easier. As for the following 2 nights on Thursday and Friday, his fever still persisted (above 38.5dC) but depended less on ibuprofen, only on PCM, so it gave me a little hope. Then one of our friends came by on Friday and lent us some essential oils and a diffuser. I see no harm in trying that. So on that night, Shern's fever spiked to 39dC once but then it came down later and he had no fever throughout. So either the essential oils worked, or the antibiotics he had been taking (3rd day then) was finally working. 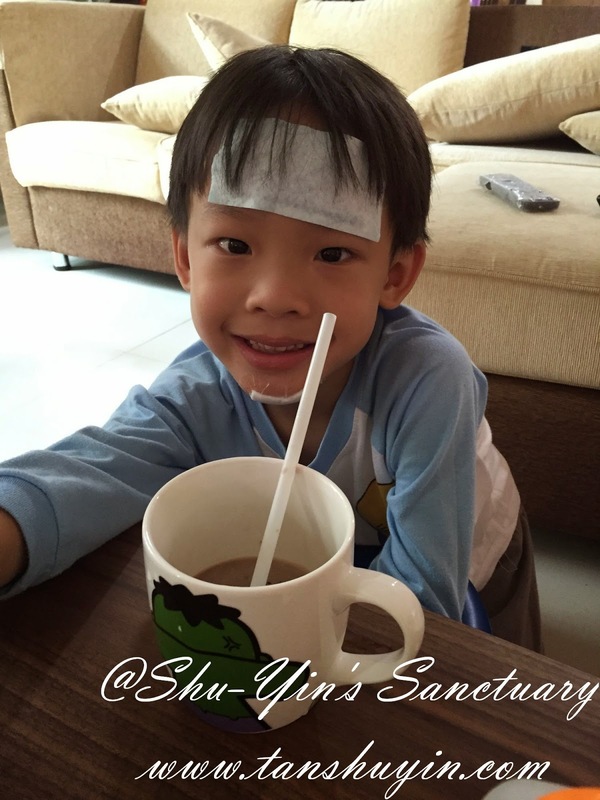 Whatever it was, I was thankful that his fever got better after so many days! A few days later, I changed the plaster on Shern's chin. It was then that I took a photo of the stitches. Shern saw the photo and asked me what are those black-black thing on his chin. I told him it was some blood residue. lol. Then I replaced a new surgical plaster for him. 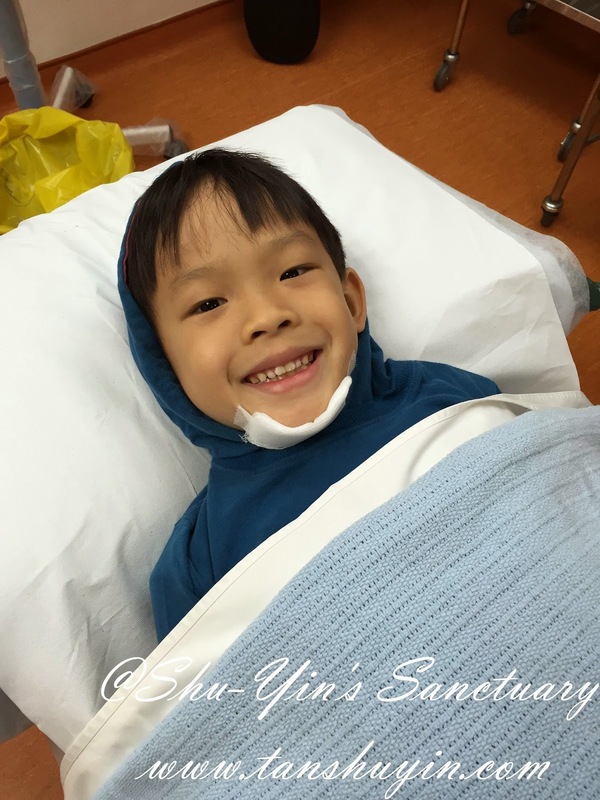 Then last Saturday, which was 10 days after his chin was being stitched up, I brought him back to see Dr. Oh. It was on a Saturday, where doctors' clinics were open for just half day, and boy, it was a long 3 hour wait to see the doctor! Shern: We waited so many hours for you, you know. You need to work faster next time! Dr. Oh : Oh, I'm so sorry it was such a long wait. So today, we are going to take out the plaster and clean your wound ok? So I am going to give you dab it a little dab with something cold. Shern: Eh, not cold also. Shern: Ouch, your touching is like pinching me. Please be gentle ok.
Dr. Oh: Ok, I'm so sorry, I will be gentle. It was funny. All was well and in about 10 minutes it was all done. There was actually a screen where the patient could view the entire procedure on how the doctor removed his stitches, but I requested the nurse to turn it off. No point letting Shern see and scaring him! Dr. Oh said his wound was healing quite well. It still has a little crust which will drop out in a day or two and some redness due to the removal of stitches. He put a normal plaster over it which he said we could remove it later to air the wound. He prescribed some cream for the scar, and that was all. No more meds needed. So this was Shern once out from the doctor's clinic. Total fee paid RM344.20. This photo was taken 3 days later. You could see the wound is really healing really well. 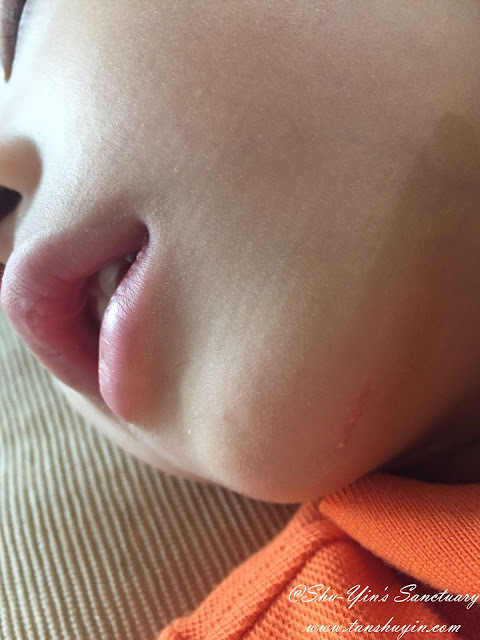 So this is the story on how my eldest son got his chin splitted and stitched up while having fever of 39.5 dC! Total damage = RM1.9k + scars + heart attack! Boys will always be boys! And I'm gonna have 3 boys soon (four including the hubby)! Update: The light scar 2 months later. OMG .... the cut is so huge !! 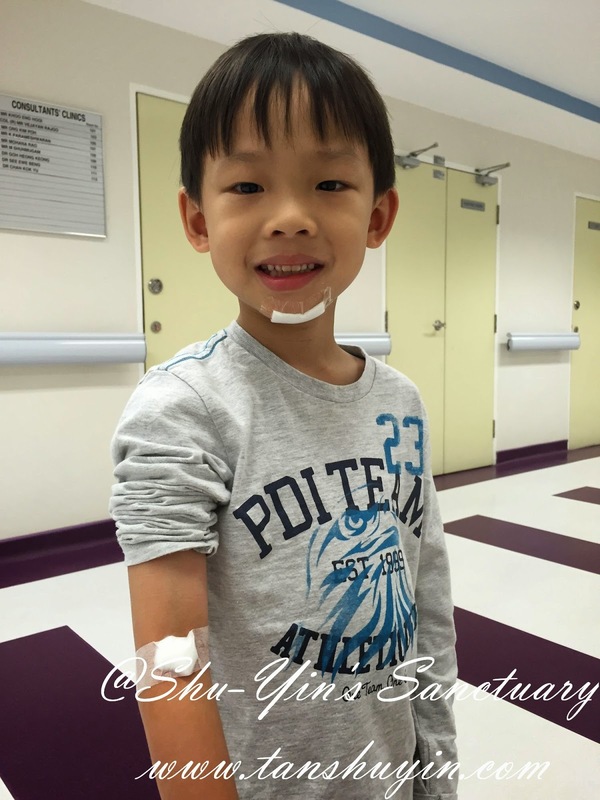 Shern is such a brave boy leh ..can tahan so many stitches and poke . $ not a concern as long boy are saved. *shudder* I still recall that moment of horror when Nathan fell down and split his lip. Sigh. I guess this is the price to pay for being a mother of boys! Serene: yeaps. the pain in the heart is more than the pain in the wallet.